Four days and three screenings into the 2008 AFI Fest, I’m one-for-two and looking to add to the “win” column as much as possible in the next week. It hit me this afternoon, though, that no two films could be better suited to an introductory update from the festival, two exercises in subverting the conventions of the biopic. One succeeds, one fails, but both maintain a certain spirit that you don’t find in the work of many filmmakers today. And interestingly, both are set for distribution by the always courageous IFC Films. Who the hell is Steve McQueen anyway? Talk about bursting onto the scene out of nowhere — with what could have been an unfortunate namesake — and carving a spot for yourself that no one will soon dispute. “Hunger” is one of the year’s best films, a curiously intimate dissection of the blanket, no wash and hunger protests of IRA prisoners held at HM Maze Prison in Lisburn, Northern Ireland in the late 1970s and early 1980s. Spearheaded by a committed (to say the least) performance from Michael Fassbender, the film may be the most visually dynamic effort to hit cinemas in 2008. McQueen deservedly won the Caméra d’Or (for best first feature) at this year’s Cannes International Film Festival, but a case might have been made for a technical citation for lenser Sean Bobbitt. He captures the most mundane and intimate moments with an epic craftsman’s touch, guided no doubt by McQueen’s own preoccupation with lingering in this most uncomfortable — and unfortunate — of settings. But it is the sparse screenplay that really sings, a document that must have been woefully lacking in white space with wall-to-wall action, all of which comments quite thoughtfully to the plight of the characters. The film plays like a silent odyssey for much of its lean (pardon the word choice) 96-minute running time. McQueen dives into the narrative from the perspective of a Maze prison guard, almost disorienting the viewer as he moves forward in the story. Eventually settling on a pair of no wash/blanket prisoners and the particulars of their day (smearing feces on the walls of their cell, crafting make-shift funnels for dispensing their bodily fluids out into the halls, etc. ), McQueen lulls the viewer into a state of awed observation before finally (and violently) introducing his hero, Bobby Sands (Fassbender). After the much-discussed 17-minute, fixed position shot that divides the film in two, the narrative becomes focused on Sands’ 66 day hunger strike, a two month stand that would end him. It is in these scenes that Fassbender might have secured momentum in the awards season with a concerted push, but I’m not sure that one is coming — certainly nothing that can compete with the dollars that will be speaking for the year’s more apparent contenders. But regardless, the performance — and the film — is absolutely harrowing every step of the way. Steven Soderbergh did not enjoy the same fortune in turning his back on convention with his much-anticipated Ernesto Guevera biopic, “Che.” Leaning on subversion for its own sake and never truly saying anything in the course of four-plus hours, the director has somehow found a way to drown an array of brilliant performances in the over-indulgence that has come to define his post-Oscar career. I should say at the top here that I am well-informed when it comes to Che Guevera. At no time during the film was I particularly lost in any biographical sense. That having been said, Soderbergh has committed the cardinal sin of making his lead absolutely vacant of drive and conviction. Nothing in the way of an expositional prologue was needed by any means, and indeed, such pandering would have been an immediate turn-off. But Del Toro’s performance is all the more miraculous considering how thinly his role was written. There are indications of philosophical difference between Guevera and Fidel Castro (Demián Bichir) that might have been expanded upon, to cite just one example. But on the whole, there is never anything in the way of meaningful introspection. A more nuanced and complex characterization of the man would have gone a long way than the haloed, near-cheeleader perception. The film becomes a driven perspective with blinders on, a decision both irresponsible and woefully lacking in artistic accomplishment. Indeed, with the consistent rally of Soderbergh’s film as a win for artistic audacity, I submit it is the least artistic film he’s spawned to date. Sean Bobbitt does more in the halls and cells of a grimy prison than Soderbergh does with the natural jungle settings of “Che.” More often settling on a cinéma vérité approach that doesn’t particularly work, the director says as little with his camera as he and screenwriter Peter Buchman do with their script. I should close by noting my agreement with Guy Lodge. 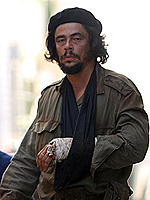 “Che” should not be considered, let alone viewed as, a singular film. “The Argentine” and “Guerrilla” are two separate entities that gain nothing (in fact, they might lose something) by being joined at the hip. Commercial viewers will get a much better perspective on the effort than awards voting bodies, one of a thousand reasons the film is likely headed for disappointment this Oscar season. How was Bichir as Che? I would love to see Michael Fassbender get a Best Actor nod. Didn’t know who the hell he was until last night’s viewing of Hunger but I’m now determined to watch everything and anything he’s ever been in. Bichir is adequate as Castro, but little is done with him over the 4+ hour runtime. As far as awards are concerned, he isn’t even on the map. Lots of he said she said in there. I’m right with you on “Hunger.” I wonder if they’ve made a mistake releasing it in December — I fear it will get lost in the crush. By the way, Steve McQueen didn’t quite come out of nowhere — he’s been a big deal on the art scene here for a while now, especially since he won the Turner Prize (a really high-profile, if often hilariously wrong-headed, art award). His video art is amazing. He certainly wasn’t on my radar. Not that that means anything. I’m glad you enjoyed Hunger and feel that it is worthy of some recognition this upcoming awards season. I just fear that the Academy won’t truly appreciate it because it’s not a feel good movie, and Michael Fassbender put his health on the line for a controversial real-life character. There is hope though that he and this great film will be honored with nominations at the least. “Hunger,” with expressionistic realism that crosses Robert Bresson’s “A Man Escapes” with George Lucas’s “THX1138,” shows the only escape is to go within, to dissolve into what’s elemental, exiting the stage where guards and prisoners are reduced to playing roles in a concentrated drama magnifying the struggle that bound England and Ireland outside those doors.